South Park is one of the most popular adult cartoons of all time, so it comes as no surprise that a slot machine has been made in their honour. The South Park slot machine is a beautifully drawn, feature rich slot from one of the world’s best online slot producers; Net Entertainment. Although slightly older than their latest release; Reel Chaos, the original South Park holds a great deal of entertainment value for the players. South Park Touch is the mobile version of this great game and has been edited in such a way to work perfectly on Apple and Android devices. 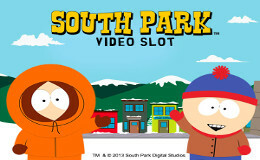 The South Park slot machine has an RTP of 96.7% across all devices with stakes from 25p up to £125 per spin. The game also has a vast amount of features which introduce all of the most popular characters from the hit series. Kyle will award ten free spins with the chance to re-trigger the bonus. There is also the opportunity to increase the value of the wins by up to X10 with the Kick the Baby in feature bonus. Kenny’s bonus game starts with three lives, you must then help him traverse three zones. Avoid losing all of his lives to win up to 2500 coins. Cartman is on his quest to kill hippies, with groups and individual hippies hiding in bushes. With each successful capture, a cash prize will be awarded. Carry on searching for more prizes, but avoid the police, you get one warning only. Stan makes an appearance, puking on poor Wendy to create sticky wilds. The sticky wilds remain in place for two spins, with the chance to add more as the feature plays along. As well as the entertaining feature games, the base game is also a delight, using themes and sounds from the TV series to immerse you in the full South Park experience.